Coffee – the morning drink choice for millions of people across the globe. Do you enjoy a cup of coffee to kick off your day? There are so many ways to drink coffee, let alone how many different types of coffee drinks are available; whether you choose a plain long black or something a little fancier, owning good quality coffee accessories can make the difference when you are brewing at home. Coffee accessories are important, especially if you want to try and make drinks such as the Moroccan Café des epices, the traditional Turkish coffee, the Spanish Café Bombónor the Greek Frappe. Each country has its own signature coffee, and many require their own special accessories to get it just right. There are some great accessories on the market to help you make a better coffee at home or work, and like all coffee drinkers, we know great accessories can make your coffee taste even better. No one wants their coffee going cold while they are focussed on other things. 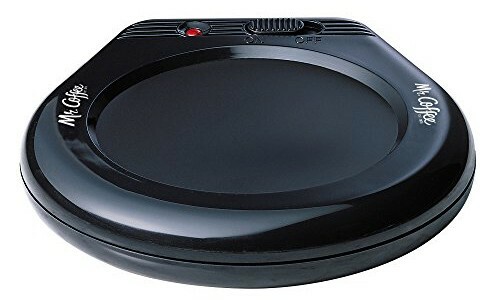 If your job means you don’t get to finish your coffee before it goes cold, the Mr. Coffee Mug Warmer is a great idea. This mug warmer is really easy to use – simply plug it in, pop your mug on top and turn it on. There are a couple of ways you can use the Mr. Coffee Mug Warmer – turn it on and place an already hot mug of coffee on it or turn it on and place a cooled mug of coffee on it. The warmer keeps your mug warm which then transfers to the liquid, so placing an already hot mug of coffee on the warmer is going to naturally keep your coffee warmer for longer. The Mr. Coffee Mug Warmer works best with flat-bottomed cups as it means your mug is absorbing as much heat as possible, however, it can also be used with soup mugs and larger mugs with smaller bases. The warmer also won’t burn your benchtop, so it is perfect for all-day use while in the office. The Mr. Coffee Mug Warmer made our list of the best Coffee Accessories due to its functionality, the ability to use it all day long and it looks great on any desk or bench. We can’t imagine anyone would argue with the fact that freshly ground coffee smells absolutely superb. 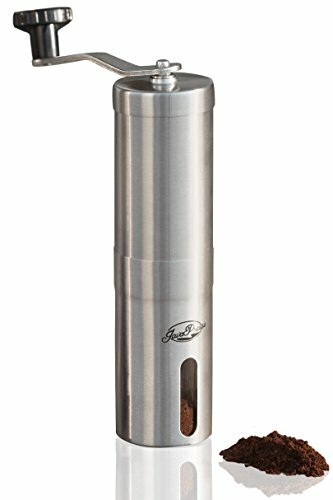 If you love the smell of freshly ground coffee then the JavaPresse Manual Coffee Grinder is what you’ve been looking for. The built-in adjustable grind selector means you have total control over the grind; selection options include pour over, cold brew, French press, Aeropress, Turkish and espresso grind – that’s a lot of coffee options right there coming out of one machine. With no batteries or power required, and small enough to fit in a briefcase or handbag, this is a great option to have in the office or at home, as well as taking with you on your next road trip – because we know that the need for coffee always strikes when there is no coffee shop for miles around. If you have a coffee lover in the family or the office, the JavaPresse Manual Coffee Grinder is a great gift option for birthdays and Christmas – it’s easy to use and easy to clean which means even the most novice of coffee drinkers will be able to utilize it. The JavaPresse Manual Coffee Grinder made it onto our Top 7 Coffee Accessories for 2019 list due to the simple fact – we can take it anywhere we go!! Are you sick of having little capsules of coffee throughout the kitchen cupboard at home or in the office? If so, the Mind Reader ‘Anchor’ Triple Drawer is a great solution. This drawer holds a large number of single serve coffee pods and easily sits underneath your single serve capsule coffee machine to maximize bench space in your office or home kitchen. The ‘Anchor’ has six rows across three draws to help you organize your pods by flavors or strength and is available in three models – the K-Cup model holds 36 capsules, the Vue Packs holds 20 capsules and the Nespresso holds 50 capsules. The K-Cup model is also able to be used with Rivo pods (space for 72), Verismo pods, CBTL pods and Dolce Gusto Pods (space for 42). The Vue model can also be used with the Tassimo T-Discs (holding 48). The ‘Anchor’ looks great in a range of kitchen settings and keeps your pods and capsules tucked away neatly – you can easily see when you need a refill, and your family and guests can easily see what coffee types you have available for them to use without hunting through your cupboards. We love the Mind Reader ‘Anchor’ Triple Drawer single serve coffee pod holder for its simple design and the fact it has helped us get all of our pods out of the pantry and into one storage space – this is why it’s on our best Coffee Accessories list. If you often need to make coffee for meetings in your office, and your guests have trouble choosing what they would like, the Coffee Pod K-Cup Storage Spinning Carousel is a stylish addition to your office kitchen. 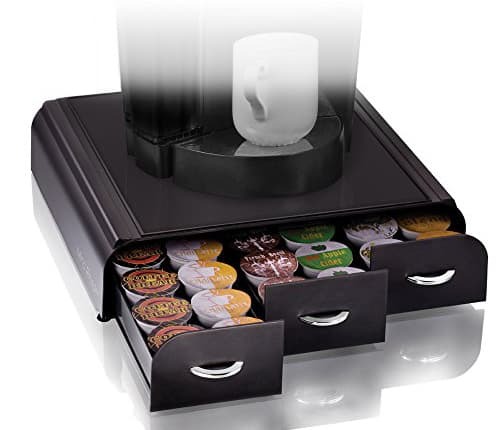 The lazy Susan design lends itself to this K-Cup storage system, with the base rotating 360-degrees for access to the capsules; the system can sit anywhere, from your office or home kitchen bench, workspace or in the pantry without taking up too much room. The carousel holds up to 35 K-cups giving you plenty of room to store various flavors and strengths. 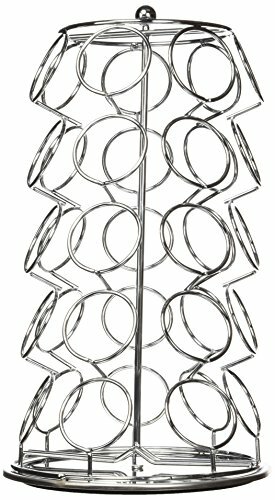 If you’re thinking about buying the K-Cup coffee maker for yourself or for a friend or family member, the Coffee Pod K-Cup Storage Spinning Carousel is a great addition to a fantastic gift idea. For anyone who loves their K-Cup coffee maker, the spinning carousel will be well received. The Coffee Pod K-Cup Storage Spinning Carousel has made it onto our list of Top Coffee Accessories list due to its functionality, and simple design allowing it to be used in any kitchen setting whether at home or the office. We love the smell of freshly ground coffee and the KRUPS F203 Electric Spice and Coffee Grinder makes it easy for us to wake up to freshly ground beans every morning. This electric coffee grinder has a large capacity, grinding up to 12 cups of coffee worth of beans fast and in uniform size – which means no huge bits of coffee beans going through your machine! You can also use the machine to grind things like spices, nuts, and grains but we’d suggest getting two machines if you are planning to do this – you don’t want to contaminate the taste of your coffee. We’ve had family members use the KRUPS F203 Electric Spice and Coffee Grinder every day for a couple of years now and they haven’t had a problem. We recently picked one up to try it out and now we’re throwing out our old grinders and this one is taking its place. The KRUPS Grinder is a budget-friendly option, so if you love fresh coffee but can’t afford a high-end grinder, this will do perfectly well. If you are in the market for a KRUPS Coffee Grinder, make sure you hunt down some good quality coffee beans. You will need to grind your beans on an ‘as required’ basis as ground coffee will oxidize very quickly. Fresh beans and a fresh grind will make all the difference to your daily coffee drinking, and you’ll find you get a better tasting coffee every time. 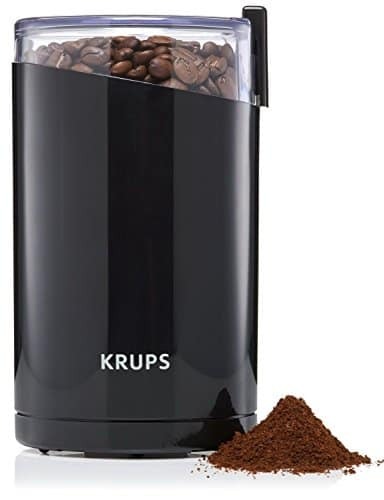 The KRUPS F203 Electric Spice and Coffee Grinder made our Coffee Accessories list for 2019 list simply because we love freshly ground coffee and at such a great price, you can’t go wrong. If you’ve ever ground your own coffee beans you’ll know that once ground, coffee beans start to oxidize and go off very quickly. It can seem like a waste of beans if you’ve ground too much, but it isn’t worth keeping them as the taste and quality deteriorate pretty quickly. This is where a product like the Friis 16-Ounce Coffee Vault is a valuable addition to your kitchen. The Vault is an airtight container which stores up to 16 ounces of whole or ground coffee, keeping it fresh and full of flavor. The Friis has a valve which vents the CO2 gasses that ground beans emit, ensuring your ground and fresh beans are kept at optimal quality. The valve is extremely important to keep your coffee fresh, especially if you roast your own beans at home – the CO2 released from the beans is the highest in the first 3 days after roasting so having a container with the ability to release this from your beans will ensure the beans are stored well. 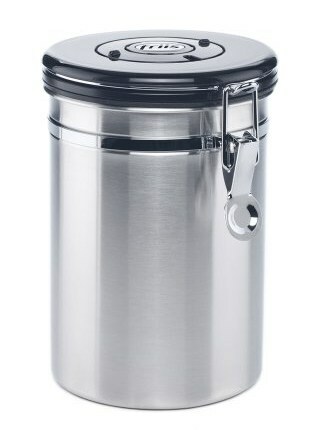 The Friss looks good as well – made of stainless steel the canister will fit well into any kitchen and is, in fact, perfect for the office or home kitchen. While we don’t roast our own beans (although it’s something we’d love to try) we do grind our own beans regularly; we’ve always had trouble keeping them fresh but since trying out the Friis Vault, we haven’t had an issue with the freshness or quality of our beans. You can probably tell why the Friis 16-Ounce Coffee Vault is on our list of the best Coffee Accessories for 2019 – keeping coffee beans and ground coffee fresh is extremely important to have a great coffee. 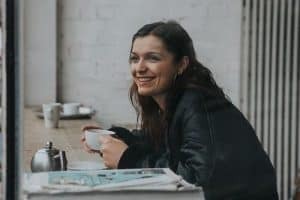 A freshly brewed coffee can make all the difference to your morning routine, but we often don’t have the time, or the space in our kitchens, for a full sized coffee maker. The Tanors Ceramic Coffee Dripper gives you the benefit of a freshly brewed coffee without the expense of buying a complete coffee machine. 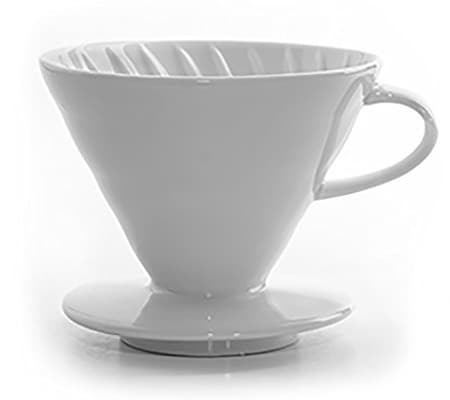 The coffee dripper has a specially designed angle with ribbed sides to allow for optimum extraction of the coffee. With a large hole at the bottom, you can create your own customized drink, with a flavor and strength you enjoy. Due to the amount of water which flows through the coffee dripper, it is essential to use good quality beans. We tried this with some older beans and while you can get the best from your beans, you also get to taste any flaws as well. The Tanors Coffee Dripper is budget friendly; so much so that you could have one dripper in the kitchen at home, one in the office and one packed away with your camping or travel gear. The dripper is handmade from quality ceramic which means you get a durable and long lasting coffee dripper you can use at home or at the office. The ceramic material is also more beneficial over a plastic dripper as it won’t soak up the coffee color like plastic models tend to do. We love using the Tanors Ceramic Coffee Dripper on a slow Sunday morning when we’ve got the time to sit down and enjoy a freshly brewed coffee. This has made our Top 7 Coffee Accessories for 2019 list because we love that we can brew a cup of coffee to our own flavor and strength without needing to fuss around with machines. We’re not going to lie – we love coffee; whether it be a long black first thing in the morning or a latte at 3 pm to get us through the rest of the day, coffee is a godsend. There are many accessories on the market that can make your coffee drinking experience a little more special and as well as those that can enhance your coffee drinking experience. We really love the accessories we’ve outlined above and more than one or two of these will make great gifts for the coming year.